Magical Uses and History: Crocuses are one of the first flowers to bloom in the spring, shortly after Imbolc in most places, making it the perfect representation of new beginnings. They are often placed on spring altars during Imbolc or Ostara, bringing a burst of color to the home or altar. The name Crocus comes from the Greek krokos, Hebrew karkom, Aramaic kurkama, and the Arabic and Person kurkum, which means yellow or thread, presumably after the saffron spice that is often obtained from the Autumn Saffron Crocus, although the petals are usually purple or blue. This spring flower is native to Mediterranean regions and has been used for centuries, leaving behind some rich history. According to Greek mythology, Mercury creating the flower from Europa's Son, Crocus, whom Mercury accidentally killed. Another Greek story tells the tale of a youthful Crocus falling in love with Smilax who later rejects him. Distraught, Crocus begs the gods for help who take pity on him and turn him into a crocus plant. Crocus turns fickle when Smilax falls in love with him, rejecting her, resulting in the gods turning her into yew. The first record of crocus coming to England was in the sixteenth century when it arrived in Queen Elizabeth's court from the Middle East. It became a favorite of Shakespeare, Francis Bacon, and the herbalist John Gerard, and later a favorite in Victorian flower language. In Victorian flower language, the crocus meant cheer and gladness, likely due to spring crocuses often being yellow. It was also believed to bring love and was often sent to a lover. In ancient Egypt, crocus was commonly burned in a censer to see a vision of the thief the may have robbed you. 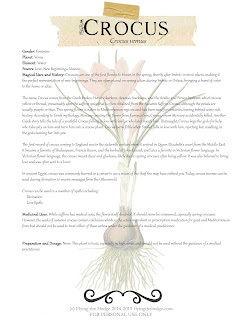 Today, crocus incense can be used during divination to receive messages from the Otherworld. Medicinal Uses: While saffron has medical uses, the flower itself does not. It should never be consumed, especially spring crocuses. However, the seeds of autumn crocus contain colchicine which is the active ingredient in prescription medication for gout and Mediterranean fever but should not be used to treat either of these unless under the guidance of a medical practitioner. Preparation and Dosage: None. This plant is toxic, especially in high doses and should not be used without the guidance of a medical practitioner.